This recipe is not a true fudge which involves heating sugar, cream, and butter to a soft ball stage. This is a cheater recipe, but I like it because it’s easy and the cream cheese adds a touch of tang. The original recipe calls for huckleberry flavor, but we not only use real butter in this house, we use real huckleberry jam! Obviously, the best possible huckleberry jam is one you make yourself from real foraged hucks. You can use store-bought huckleberry jam (or some other flavor of jam), but beware that some brands are practically flavorless ripoffs. I recommend using the highest quality white chocolate you can get your hands on. For me, that’s Valrhona. Crappy white chocolate or fake white chocolate will taint the fudge with its inferior flavor and texture. Not being a fan of white chocolate, the real deal makes all the difference. 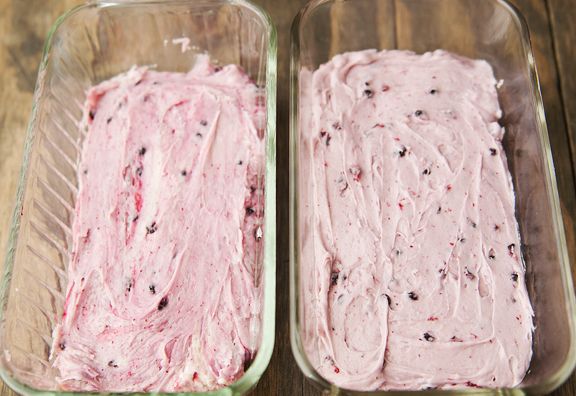 I split the batch in half and made a blended version and a swirl version of the huckleberry fudge. I didn’t think there would be much difference between the two other than aesthetics, but I was mistaken. The blended version had a smoother and more uniform texture. The swirl fudge was ever-so-slightly less smooth with sections of white fudge intermingled with ribbons of huckleberry jam. My preference was for the blended fudge, although they are both excellent. 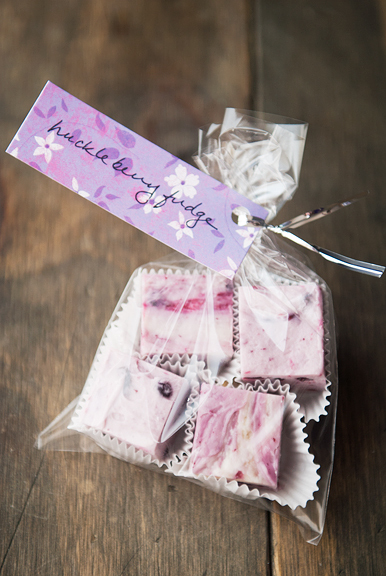 Despite my general indifference for fudge, this huckleberry fudge is fantastically huckleberry-ish! I nibble on a 1-inch cube such that it takes me 30 minutes to finish. 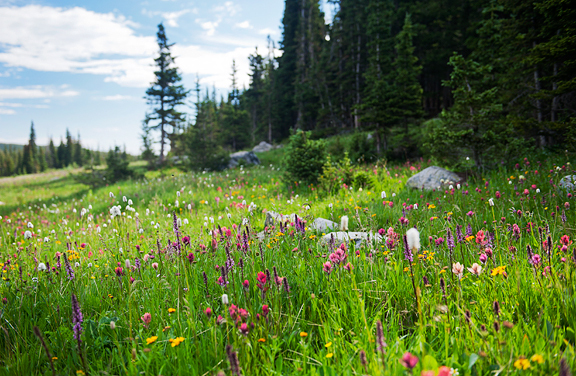 Is it as good as the huck fudge in Montana? Truth be told, it was so long ago (uh, 18 years to be exact) that I don’t remember. This recipe is pretty spanking good, though. It’s especially awesome when you bite on one of the little berries because we all know that huckleberries are the number one absolute awesomest best berries in the world. And because I can forage the huckleberries in my local mountains, it tastes like home. Line an 8×8-inch baking pan with parchment or wax paper. 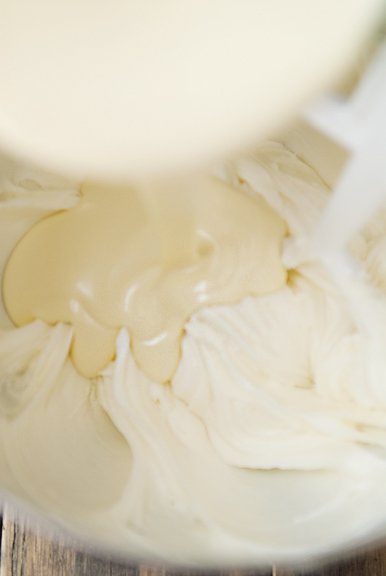 Beat the cream cheese in a stand mixer with the paddle attachment (or by hand or with a hand mixer) until smooth. Add the powdered sugar one cup at a time and beat until smooth and incorporated. 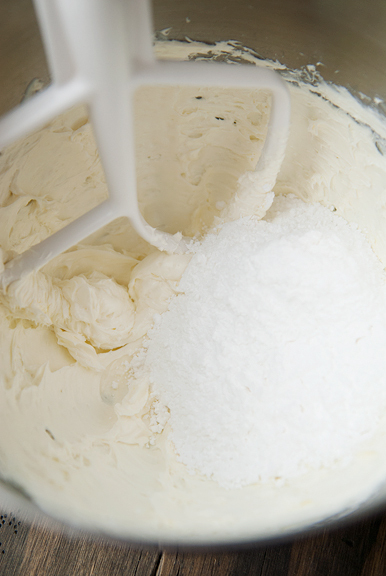 Repeat until all of the sugar is added to the cream cheese. 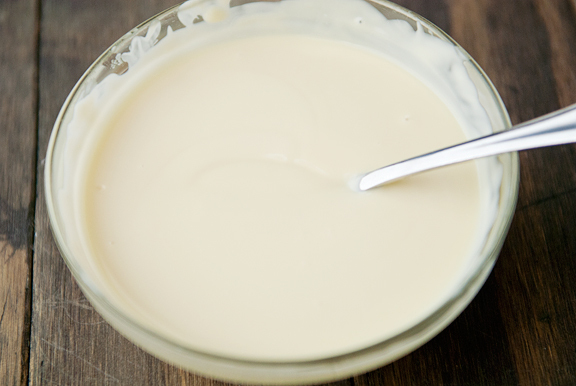 Melt the white chocolate on half power for a minute in a microwave. Stir and melt for another minute on half power until mostly melted. Remove from microwave and continue stirring until all solids have liquified. If you don’t like or don’t have a microwave, you can set the white chocolate in a heatproof bowl and then set the bowl on top of a pot of simmering water (about an inch of water is enough), stirring until the chocolate melts. 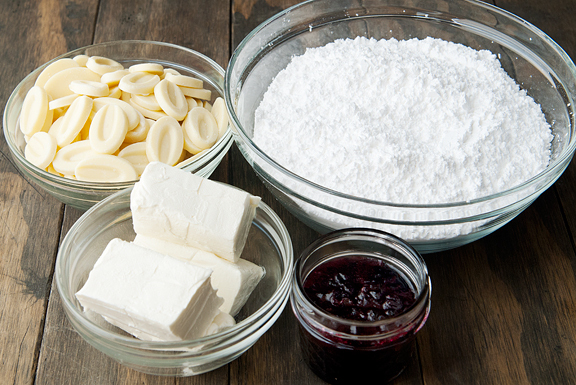 Add the white chocolate to the cream cheese mixture and beat until combined. It will lose the smooth texture and become fluffier. 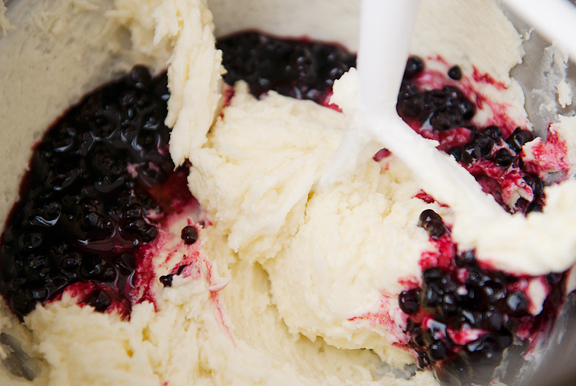 At this point, you can either mix the jam into the cream cheese mixture until completely blended, or you can swirl the jam into the mixture by hand. I prefer the blended version as it has a smoother texture in the final fudge. 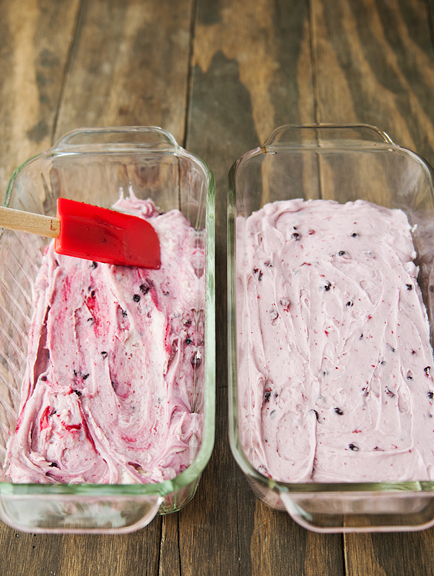 Pour the fudge into the baking pan and smooth it out evenly. Refrigerate the fudge until firm (about an hour). 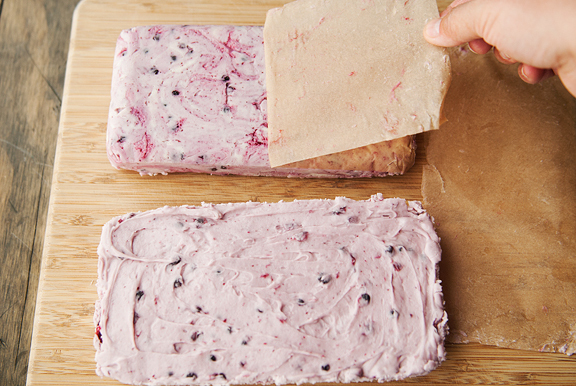 Remove the fudge from the pan and slice with a wet knife (clean the knife between cuts for cleaner slices). Makes 64 1-inch squares. Store in an airtight container in the refrigerator for up to a month. OH YUM!!!!!!!!!!! Whoever is getting that package is ONE lucky friend! BTW, how old was Kaweah in the framed pictures? I know exactly how you feel. I still remember the time when we went to pick up our box of Oscardog, and to my surprise, I bursted into tears in the car. My husband said, “Well you know that’s our dog, because that box is heavy.” He was 95 lbs at the end; he was a big boy. Now he sits on our fireplace mantel. I cried the whole way when I drove our dog home from the vet’s for the very last time. Her little box is on our hall table. It took a long, long time for me to stop bursting into tears about it. Well, okay, it hasn’t stopped, but it does happen less often these days (we’re at the 6 month mark). Give yourself lots of time. I don’t care for regular fudge either, but this one looks good! I bet the rest of my family (all enthusiastic eaters of chocolate fudge) wouldn’t like it, of course. Yum! I don’t think I’ve ever tried huckleberries. This may be just the way to try them out! Never has there been such a precious pup, nor one so loved and treasured! Bless you guys! 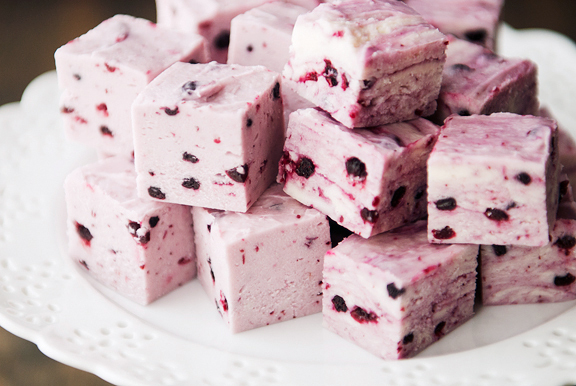 The huckleberry fudge looks yummy. I’ve never been fortunate enough to try the berries or anything made with them. I’m tempted to try to remedy that, but want to be careful not to run into a poor quality huckleberry product that leaves me wondering what you are raving about! This fudge is such a neat flavour! 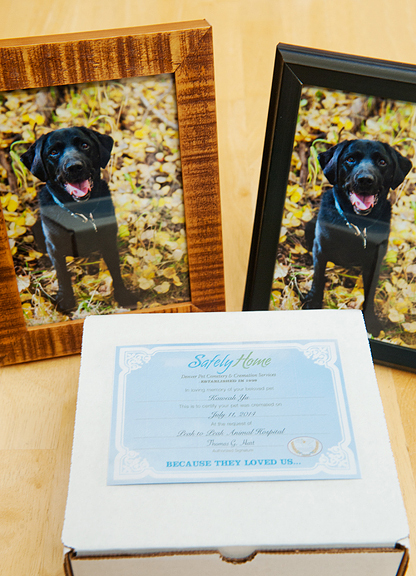 And I love the little framed photos of Kaweah…such a special pup. 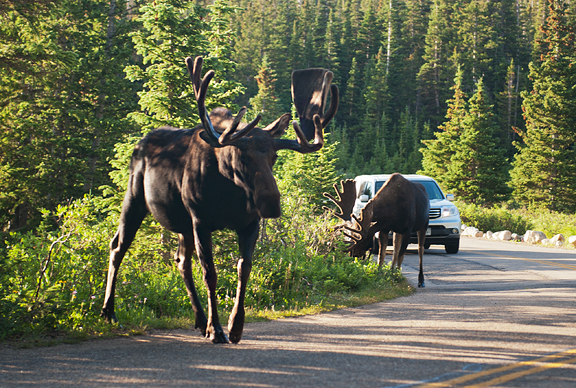 Huckleberry fudge is where its at and those Moose pictures are incredible. They are so HUGE!!! 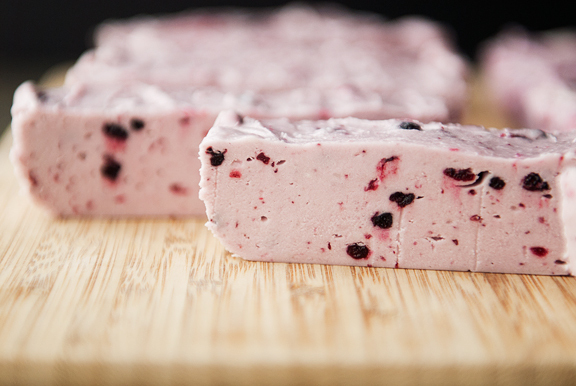 Coincidentally, it’s been about that long since I tasted true Montana huckleberry fudge, too. Oh my, what an incredible treat and all that goodness confounded my inability to find it here above the 49th parallel. 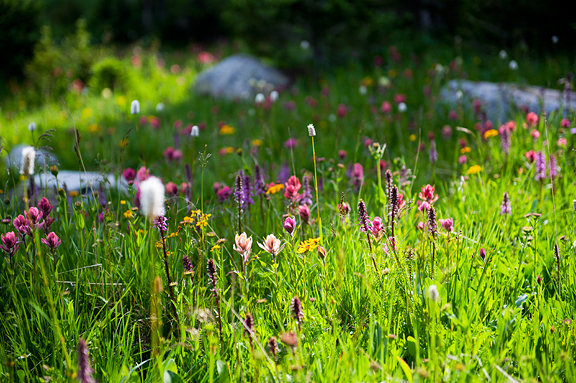 Our hucks are 100% ready right now and my husband and I agree that it is the biggest crop we’ve ever seen–must be all that rain in June followed by the July heat-wave! I’ve measured some berries: over 1/2″ diam! So, off to the woods again soon. A huge thank you for the huck-fudge recipe; have company coming this weekend so heading for the kitchen to make a batch of jam for fresh fudge right now. Can this recipe be modified with any berry? How about with a stone fruit (I’m thinking Palisade peaches)? OH WOW! So, you basically just gave a recipe to make fudge with any flavor jam. Thank YOU SO MUCH!!! 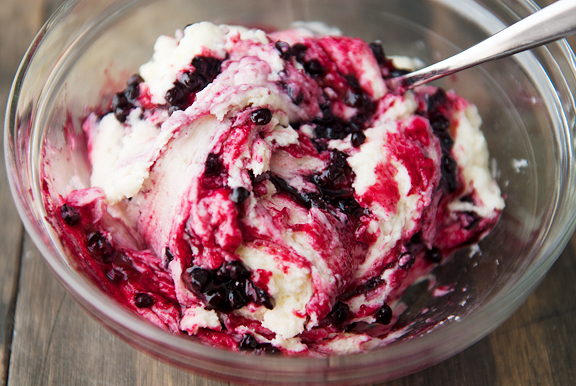 I can’t wait to try this (and huckleberries if I can ever find them). that was a most aesthetic experience just enjoying the story and the pictures. you covered a lot of ground there. hope your heart is healing a bit. 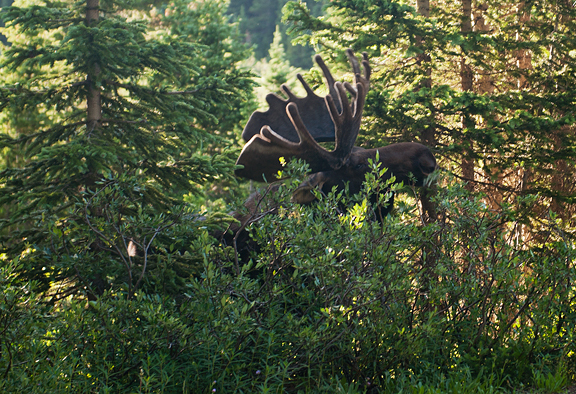 huckleberries, moose, wildflowers, the love of a cherished friend. life can be so good. Do you know what species of huckleberry you have there? That plant looks totally different from what we call red or blue huckleberries here in the Cascades. I bet it would be good made with lingonberries too! be gentle with yourself. your loss was great and it will take a lot of time for it to ease. i’m not sure we ever “get over” it so much as adjust to it. so there will be a time when fewer tears come but that doesn’t mean they won’t come at all sometime out of the blue. 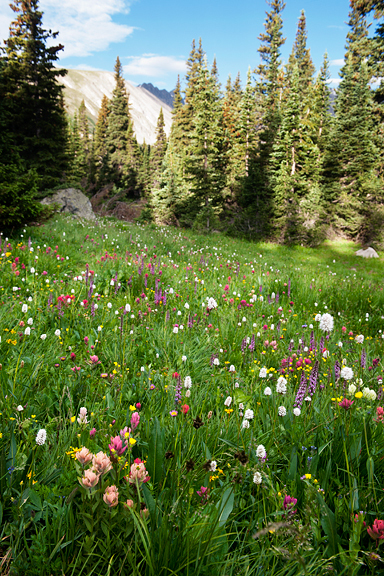 most of all you are so correct that is not gone but rather in your heart now. take care. Wow, your photos always brighten my day! 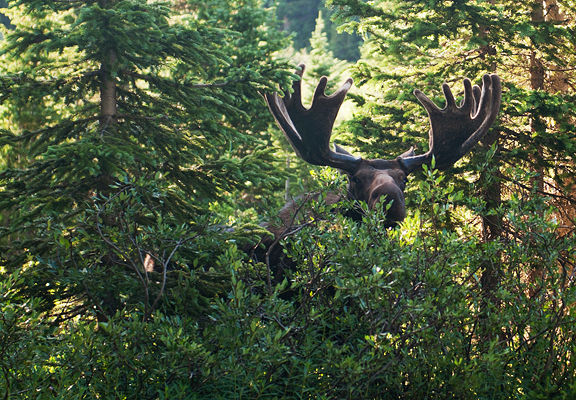 Those moose! You crack me up about not liking hot weather, because I live in Oklahoma and it is near 100 degrees here most summer days and I love it. I admire your love for the cold temps, but I am such a weenie during the winter months. I do have my siberian husky now so I better get ready for being out in the cold with her! I know she will be in heaven when it gets cold which will make it worthwhile to freeze my tushka off for her happiness. 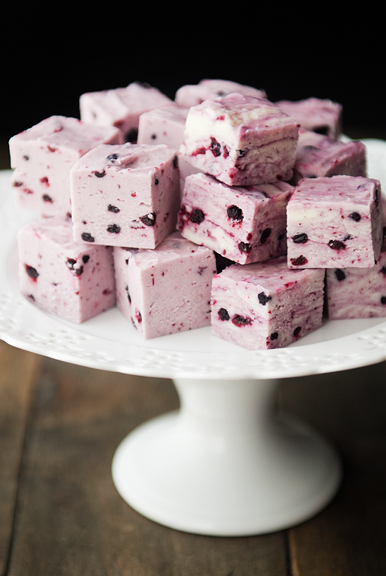 I am not usually a white chocolate fan, but this fudge with huckleberries is enticing! Baby June – thank you! 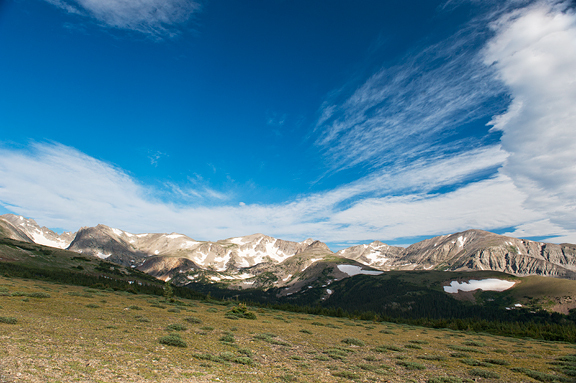 Pey-Lih – Kawah was 11. We’re still trying to figure out what to do with Kaweah, but for now she’s in the great room. Sarah – thanks, we are moving on with our lives, but we sure miss her. Kristin – awwww. They really are family. As for fresh hucks, I wonder if you can mail order them from Montana? Kate – I know, they are ginormous!! Bev – wow, I am in awe of the size of your hucks. Ours are little guys :) Good luck!! I hope you found lots! Robin – mmmmm, sounds fantastic. Gail – I’ll bet they were delicious with blackberries. JulieT – I’m guessing yes, although I haven’t experimented with any. Let me know if you meet with success! Gabbi – I don’t actually know. 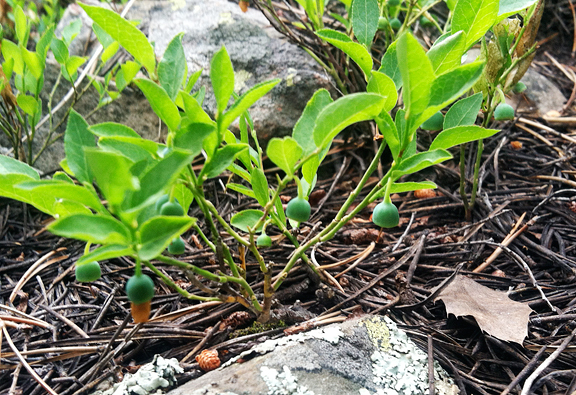 We have a couple of plants (some with big leaves, some with teeny tiny leaves) that produce huckleberries. I think there are several varieties. Becky – I knew there were people out there who love the heat ;) You are more likely the norm and I am definitely the oddball ;) Hope your pup doesn’t overheat! I don’t think we ever imagine how much we will miss our beloved pets nor how or what will spark tears even many, many years down the road. I suppose it’s because we love them so much. You’re right….one moves on but I don’t know they ever aren’t missed. I’m going to have to try huckleberries. I really prefer white chocolate so this looks like a fun way to try them. How long does this fudge take to become firm? I followed the recipe, but the mix is still very,very soft. Its been 4 hours now. Hi Melissa – I answered you on Facebook, but I’ll also answer here. It took an hour for it to firm for me. If your fudge never firmed up, feel free to describe exactly what ingredients you used, how you measured them, and what steps you took (and any deviations from the recipe). We can try and troubleshoot. It’s been an hour and set up still soft.???? Maybe needs more shite chocolate next time? Followed recipe exactly. Followed recipe and after an hour still soft. Linda – Did you try leaving it in overnight?